One of the pre-NAB announcements that somehow slipped under our the radar this week refers to the Chinese company Z CAM which has recently introduced a series of modular E2 full frame cameras with 6K and 8K shooting capabilities as well as more affordable Super 35mm and Micro Four Thirds versions. 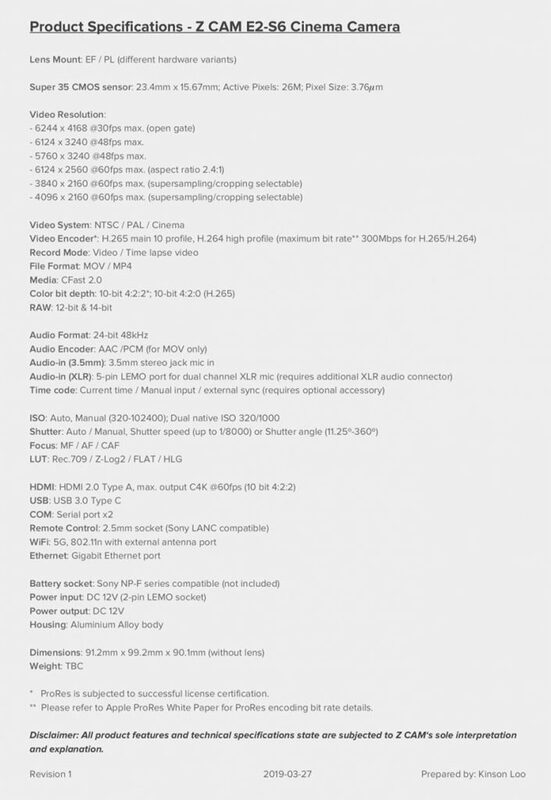 Some highlights of the indeed impressive spec sheet that was released a few days ago includes 6K and 8K 10bit ProRes recording to CFast cards, a max bitrate of 230 Mbps for 4095 x 2160, and 10bit H.265 and 8bit H.264 support. The new Z Cam E2’s are set to hit the market in October 2019. Just as a reference, the current Z CAM E2 model sports a 4/3-inch CMOS sensor capable of shooting 4K 10bit video up to 120fps in ProRes 422 as well as H.265 (10bit Long GOP by default) or H.264 – all of this in a size a little bit bigger than a Rubik’s cube. The Micro Four Thirds mount enables a huge range of lenses to be adapted or alternatively – use native Micro 4/3 lenses made for and by Panasonic, Olympus, SLR Magic, and other manufacturers. The E2 offers a wide range of output connections such as HDMI for monitoring, SYNC port for multiple cameras, Ethernet and USB-C. C-Fast 2.0 is the recording media. The unit can be powered by the widely available and affordable Sony NP-F style batteries and also offers iOS app integration for further convenience. Z CAM E2_official sample footage from Z CAM on Vimeo. The upcoming 6K versions of the popular camera will be available in S35 or full frame, while the 8K will only be available in a full frame version. The Z Cam E2-S6 S35 6K camera will cost $3,995 and will be available in either PL/EF or M4/3 mounts. The E2-F6 FF and E2-F8 FF, on the other hand, will only be available with PL or EF mount selling for $4,995 and $5,995 respectively.